In 2009 I could not walk up a single flight of stairs without having to pause and catch my breath before continuing. Over 15 or so years I tried all the diets, some of them several times. I lost 40 pounds, gained back 60, then after a year or two did it all over again and again and again. I probably bought and sold a gym’s worth of equipment over those years. High hopes and plans quickly turn into clothes racks and dust collectors. I knew I was fat but my mind still conceived an image of the thin young girl of the past. I tried my best not to be in pictures and if it could not be avoided, I would delete or destroy them as soon as I could. I knew it was there but it was much, much easier not to face it. I ate all the crap, fast food, several cocktails after work, and more on the weekends. Food was anything easy and I spent many a day in the drive thru line for breakfast and lunch. Too often Friday or Saturday night entertainment would be going out to the steak house, pasta and bread place, or burger joint. On top of it all I was completely stressed and my work life was spinning out of control. To the point that one evening I thought I was having a heart attack. I woke my husband and after a trip to the ER and some tests, it turned out to be a panic attack. I was a hot mess! Over the next year or so I watched my friend Peggi make changes in her diet, food and health. I started asking questions and trying some stuff out but wasn’t anywhere near ready to give up drive thru food or my beer. 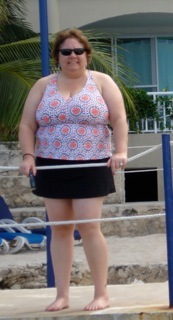 Then we went on vacation to Cozumel in February 2011 and along came those dreaded pictures. It was like someone slapped me right in the face. I’m not sure how I was able to look myself in the mirror before and not realize it until I looked at those pictures. I’m as big as a house! I’ve got to get control of myself right now! Peggi helped me get set up with my coach Courtney and the journey began. When I stepped on the scale for my first weigh in I was 255 pounds. OMG! I weighed more than my husband. I lost quite a bit of weight over those first few months I went from 1800 to 2700 calories and I was happy to eat it all. Who would think I could eat 2700 calories a day and loose several pounds per week. I had no idea what to set as a final goal and I did not want to think about it so I set my sights on getting and staying below 200 pounds. After 9 months I was there and it was awesome. At this point it quickly became clear that I would need to loose 100 pounds or more overall to get where I really needed to be. Since then I’ve traveled to Italy for work, made another trip to Cozumel and a weeklong boat trip up the lake last summer. Every time I traveled I worked my food plans right into the trip. It was not really that big of a deal to travel because my food choices and preparation had really become part of my lifestyle. Like brushing my teeth and showering each day, it’s what I do. I believe the difference is having a positive attitude throughout. Going to kundalini yoga helped me learn to focus and let go of negative thoughts and actions. Also important was using a support system of friends and fellow GT members; some of whom I’ve never met but they’ve lent tons of support via facebook and the GT online program. That’s why Genesis is so different than other programs out there. Not only does it teach you about eating but also addresses the self-care that is lacking in this crazy fast paced world we live in. As I write this I ask my husband if it’s ok to say it was really not that hard to get here. It was pretty easy overall. Sure there were times when I thought about diving into treats at work, or early on when I did not bring food along and was starving, but you learn over time. By far, the complements of my ongoing progress were so much more rewarding than a cupcake or slice of pizza. If I failed I would only have myself to blame. I stopped making excuses, got busy, and it worked. No pills. No surgery. Just clean food, exercise (not a ton either), and guidance from my wonderful coach. I still have some work to do but I’m hanging out here at 155 for a little while so I can reflect on the past 2 years and get ready to focus on what’s next. Check out our Transformation gallery!